Are you needing to purchase 72-inch round tables? You can view our 72-inch round tables here. When you see a round table described as 72-inches round, this measurement refers to the diameter of the table top. 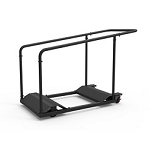 An important determination table customers typically need to make is how 72 Inch Round Tables do they need for a specific amount of people. Part of this determination, however, is subjective. For instance, you could crowd your 72 round table with people, seated shoulder touching one another and fit many more people around a table than someone who wants people to have enough space to actually move and feel comfortable. 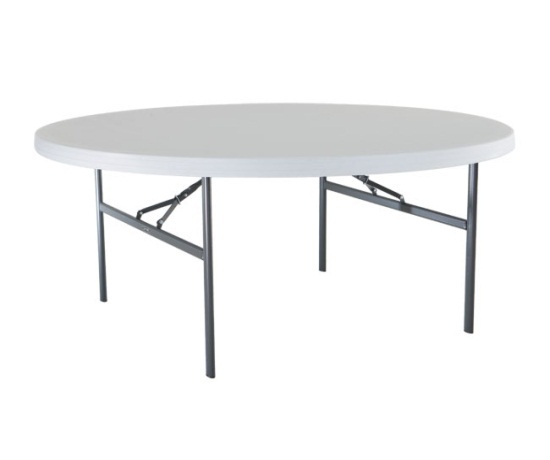 72-inch round folding tables are one of the more tricky tables to determine seating capacity. Here are some ways to go about it. One way to determine seating capacity is to look at the circumference of the round table and decide how much space each person will require at the table. So let's break this down into inches. The circumference of a 72-inch table is about 226 inches. In general, to sit comfortably most people need about 24 inches of table space. With a round-shaped table, that can be fudged a little bit because people will actually be seated farther away from each other - because of the round table shape - than on a rectangular table. So, doing some quick math, having 10 people seated at the table gets each person 22.6 inches of table perimeter for seating. We estimated in our circumference method above that 72-inch round tables likely have enough space to seat 10 people in general. However, what if the occupants were all first graders? What if they were all football players? That seating capacity could change considerably depending on what size of person will be seated at the table. In general, seating capacity can be broken down as follows: 46/48-inch round tables can seat 6, 60-inch round tables can seat 8, and 72-inch round tables can seat 10. From these numbers, use the other two methods to see if you can squeeze a few more people around the table, or if occupants might need more space than normal, which will limit the amount of seating positions. Hello there. I found your blog the use of windows live messenger. That's a seriously wisely authored write-up. I'm going to be guaranteed to search for that and revisit find out added of this beneficial facts. Many thanks for the write-up. We'll absolutely return. I have never actually thought about this, we usually just pile in and that's that. But with an upcoming celebration that we have, we have those same sized tables and this will help us figure out how many we can seat comfortably.